The HAN BioCentre is the Centre of Expertise for Biotechnology and Analysis at the HAN University of Applied Sciences in Nijmegen. We carry out applied research within the theme of Biodiscovery in collaboration with business partners and other research institutes. The resulting knowledge contributes to the Biobased economy. The research and facilities of the HAN BioCentre are accessible for professionals, lecturers, students and businesses. A fertile environment for innovation! 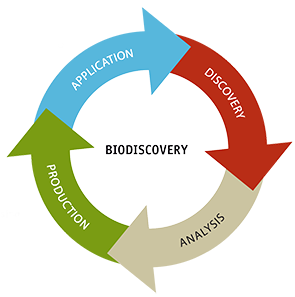 We provide applied research to support the bio-based economy within the whole Biodiscovery chain: from discovery through analysis, to production and application of (new) biomolecules. These molecules include, for example, new enzymes, bioactive peptides, anti-microbial components, but also secondary plant metabolites. The application domains include the agricultural as well as the food/feed and life sciences sector. Become a partner in research?